Disclaimer: As a product reviewer for Commute By Bike, I am providing my unbiased opinion of any products provided to us by any company. I do not posses any type of relationship with the product’s company or parent companies. Companies that send in their goods to be reviewed do not compensate me any way. My background: I am 5″9″ 185 lbs. I am a bicycle commuter that travels 8 miles round trip and I am also a typical weekend warrior mountain biker. Testing Grounds: Backwoods of New Cumberland, Stony Creek Trail, and the streets of Harrisburg PA. Advertised as: Patented tie-down system individually secures and protects bicycles. 28″ long carry arms easily accommodate up to 5 bikes. Minor assembly required. Sets up and installs in less than 5 minutes. Included strap eliminates lower bicycle movement. For 2″ Hitches Only. The 550RR’s patented tie-down system worked great. It did not matter what type of bike frame you slapped on the rack, once you cinch down the straps, it wasn’t moving. The Allen Bike Rack 550RR was built to last. I was concerned about weight limits. So I tested it’s strength with my own weight. It’s well built frame easily held me up. Seems like no harm can come to it’s 2″ square tubing. 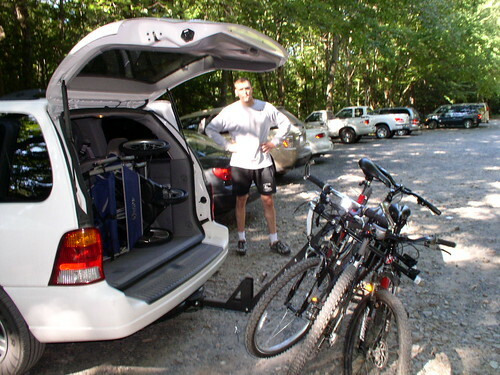 Most of all, the bike rack could fold down even with the bikes attached if you need to get into your trunk. Weaknesses: During our testing period, I did not experience any issues or weaknesses with the Allen Bike Rack 550RR. If you are in the market for a great bike rack that would protect your prized possessions, affordable, and built to last; the Allen Bike Rack 550RR is the rack for you. Awesome and very helpful review. Thanks for taking the time for the images. 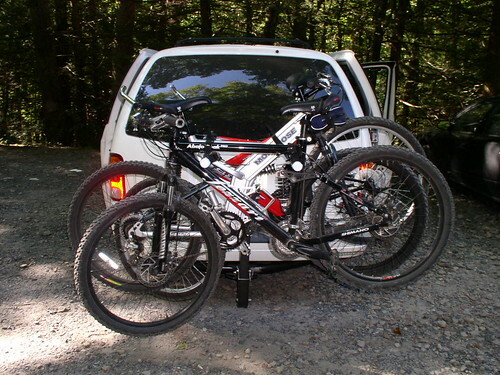 We couldn’t find images that had 4 or more bikes on the hitch ANYWHERE, thanks to you we can see how it looks. Thanks for the review. I just bought one and I’m a little leary about my upcoming road trip with 4 bikes. I bought the 640RR to clear my spare tire. Seems like a lot of weight hanging way off the back of the vehicle (Honda CRV). Here’s hoping all goes well. Me and my wife just had a $1000 worth of bikes destroyed because of this rack. I would not use one again if they paid me to. It was the first trip with our new treks. They only had about 8 miles on them. The bottom bolt sheared off while we were on the way to vacation. Nice way to start a week off of work.It happened to another family as well. We met them at the bike shop in kentucky. I appreciate this great review and pictures. It’s very helpful. I just got mine for a great deal and can’t wait for my first trip. I agree with Jeremy about the wimpy bottom bolt (and 2 top bolts too) because the 3/8″ bolt doesn’t seem to be strong enough for the job. Allen could have used a 1/2″ or even 5/8″ bolt instead. I modify mine by widening the holes to 1/2″ then secure it with a 1/2″ receiver lock from Master Lock (see link to Master lock website). This would provide both the added strength and security for the equipment.